It’s been quite a while since I’ve really had time to sit down and create something, and even longer since I’ve written a tutorial. This one is quick and very simple, and was inspired by Lindsey from The Pleated Poppy. (If you haven’t read her adorable blog or checked out her shop, you really should!). 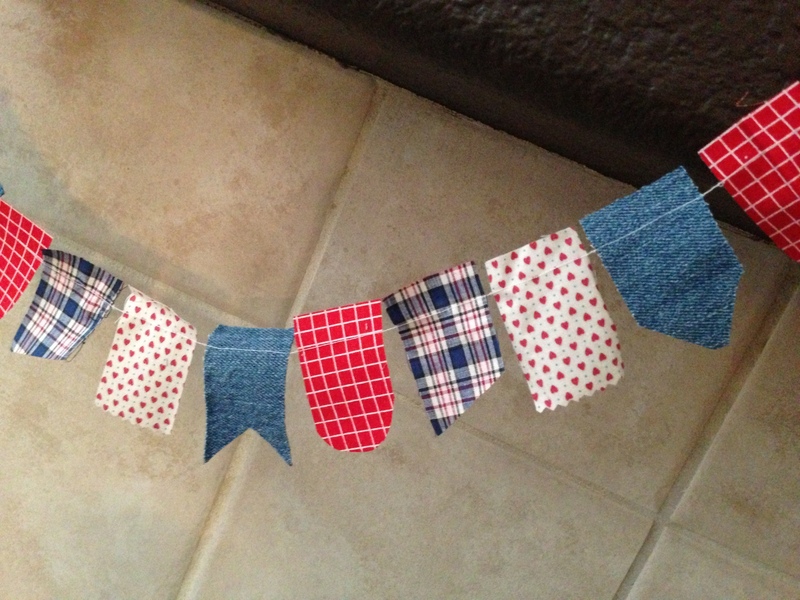 Her Patriotic Scrappy Bunting is super cute, and since my decor stash is sorely lacking in red, white, and blue, I figured this would be the perfect project to whip up. I started by selecting my fabrics. The denim actually came from a pair of Ryder’s jeans that had holes in the knees, and the others were just things I had in my stash. In true “me” fashion, I just kinda eyeballed it and decided that my pieces would be 2 1/2″ x 1 1/2″. I cut fourteen rectangles from each fabric. (Fourteen was totally random… it’s just how many pieces I managed to get out of one leg of those jeans, so I went with it. If you’re the measuring type, you may want to figure out if you need more or less than what I used based upon where you plan to hang yours.) Then I trimmed the edges, using a different design for each fabric choice and ran them through my sewing machine using a long straight stitch. Leave a long tail of thread at each end so you have something to hang it with.